(CNN) - A different side of all-but-declared presidential candidate Mitt Romney came out to play Tuesday morning when he admitted to reading the "Twilight" book series and watching "American Idol." "American Idol I watched, this year it was Scotty (McCreery) winning, that was terrific," Romney said on NBC's "Today." "That guy's got talent." And he likes the "silly stuff too." "I mean I like the Twilight series. I thought it was fun," Romney said. "I don't like vampires personally, I don't know any but you know my granddaughter was reading it and I thought, well this looks like fun so I read that." Although he doesn't have an ipod, he does listen to rock, country and The Beatles on his ipad. "The Beatles, I mean the Beatles were phenomenal," Romney said. The former Massachusetts governor and 2008 GOP presidential contender has a reputation for being a stuffed shirt, honed during his last bid for the White House when a tie and stiff answers were the norm. But his wife Ann said that public perception "is so different than what I know." "He's really very funny. I love being around him because me makes me laugh. We laugh a lot," Ann said. "The little glimpses that you get are not really accurate … They don't see him as a casual guy that he is and most of the time his hair really is messed up." Romney is scheduled to formally announce his second bid for the White House at an event in New Hampshire on Thursday. I applaud the man for reading a book about vampires because his granddaughter was reading it. I would want to know what was in it, too. Wouldn't you? EGAD!!! The guy sounds like Yoda! Mitt Romney - He'll say ANYTHING to get elected ! 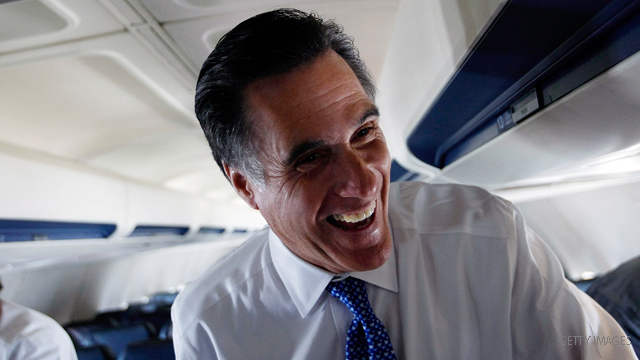 The attempt to remake the the stiff, uncaring, uninspiring, Gordon-Gekko image of Mitt Romney continues. Honestly, who gives any credence to what his wife thinks of him? She has to sleep with him each night. We don't have to. Didn't we learn anything the last time the wife of a image obsessed Republican Governor vouched for him at the top of her lungs? Maria gave Arnold a full throated endorsement in the face of women claiming that he groped them. Her line was, "Who are you going to believe? Me or someone that knew him briefly." Looks like we should have believe our gut instincts then and we should trust them now. Romney is fake. He's slimey. There is no subtsantive difference between "RomneyCare" and national healthcare reform. Romney doesn't know anything about the economy. What he knows is how to borrow other people's money, buy distressed companies, reduced costs by firing [not hiring] people, cut these long standing employers up into pieces, sell the pieces off higher prices, take the proceed of the sale and pay off the people he borrowed from, and pocket whatever is left over. How is that relevant for turning around the US economy? It is not! Don't fall for the Extreme Makeover of Mitt Romney. Romney seems to be from The Twilight Zone or Outer limits. Maybe this dufus Romney should contest in American Idol...it will be nice to see twist like a pretzel on RomneyCare and his "business acumen" where he outsourced American jobs and gave tax cuts to his rich buddies!!! Are Romney 4 sons serving in the military yet?...doubt it! Mittens' voice is currently being drowned out by the shrill screeching of Failin Palin and now the Minnesota dim-bulb. Maybe they are doing it on purpose so Mity won't get grilled on his flip-flopping, but coming soon is a deluge of name-calling and claims about his policies that are not "pure republican" and then it's goodbye Romney. Here we go. An effort to make Mr. Mittens look like a common man. Note to all presidential candidates–a "common man" is not what it takes to run the most complex nation state in history. I would prefer that the president or a potential president not waste his time on trailer-trash reality TV like "American Idol." Better to bone up on how to create jobs Mr. Mittens. Neither American Idol nor the Twilight series is gonna do it. (BTW, is the Twilight series approved for the LDS reading list by the Grand Dragon in Salt Lake City?) Oh, and cutting taxes (again) isn't going to create jobs either. Note carefully that 51% of all 2009 filers had $0 federal income tax liability. Difficult to give those folks another tax cut. Just heard this clown on TV saying that President Obama has been a "failure". W.T.F!! I suppose creating a couple hundred thousand jobs a months instead of losing almost a million jobs a month is a failure to Mitt. I suppose healthcare reforms is a failure. I suppose killing Osama is a failure. I suppose holding BP accountable for the gulf oil spill is a failure. Mitt is living in a make believe world where he is welcomed with open arms by the republican party. Poor fool. He is not a WASP and will NEVER win the republican nomination as a result. Just think...a few years ago he was ripping Obama about his religion. Now, Mitt will be on the receiving end of that attack from his own party. Poetic justice if you ask me.. I don't know which is more pathetic: If he actually read the Twilight books, or if he is just claiming to have read them to pander to the public. This dude may be front runner...but GOP thugs do not have any one....true...true...Among all the GOP junk, this dude is little better....o.k, Tim, Rick, Ryan, Eric, John, all just thugs, and bad to the nation...their motto is to cut medicare, do you know who suffers, Elderly, they want to cut Social Security, you know who suffers, Retired....listen...true...true...why didn't they object when we went to needless Iraq war, to drain the nation...????? ?Idiots...now they want power....America, wake up....good luck, We also need to nab Pharmacy companies....they are charging outrageous, same costs in india for less then dollar, now here, 250/dollars....greed, greed, and greed....that's it...USA please get rid of greed...you the best in the world....good luck..
Mitt Romney is trying to become "just a regular guy". Yeah, right. You believe that and I got an Iraqi WMD I'll sell you cheap. Wow, a Presidential candidate (GOP) that reads teen novels and watches American Idol. Way to go Mr. Magic Underpants. This is embarassing. You are running for President of the United States, not Miley Cyrus' fan club you idiot. So, we know he reads chic lit... Does this matter? He does know that vampires are mythical, doesn't he? More like the Twilight Zone. I will not vote for someone who has Joseph Smith as their savior. "The little glimpses that you get are not really accurate … They don't see him as a casual guy that he is and most of the time his hair really is messed up." Please take out your wallet and pass one man card to the front. What a smarmy poseur! Just trying to show he's "plain folks", not another flip-flopping opportunistic political hack in a suit. Sorry! It didn't work. You may be a real "hep cat" , liking the Beatles and all (how EDGY! ), but you're grasping phoniness shines through. Oh boy, he's just a regular (multimillionaire) guy! Kudos to the staff for prepping him. Who cares. The republicans are eating their own. He will never win, because his party is so hypocritical of everyone that does not swing to the hard right. Plus he is a mormon to boot. That should automatically disqualify him to hold any office. "He's really very funny. I love being around him because me makes me laugh. We laugh a lot,"